Posted on October 10, 2018 at 5:34 am. Today is an EARLY RELEASE DAY at WMS, so we’ll be following a shortened schedule. Be advised that TA will end promptly at 8 A.M., and the school day will be over at 11:54. Be sure to check with your TA teacher for your class schedule and lunch period. Hooray for the short day!! In honor of Hispanic Heritage Month, we’ve got a musical treat for you today. A selection of traditional and popular Latin music will be played during all grade-level lunches in the cafeteria. So grab your lunch and enjoy the tunes, Williamsburg! And now it’s time for WOLF PACK PRIDE! The WMS Boys Soccer team scored a razor-thin victory over cross town rival Swanson Middle School yesterday by a score of 2 to 1 — keeping their undefeated season intact. Shout out to 8th graders Tony N. and John E., who both scored for the Wolves. And nice job by the team defense smothering the other team’s attack. Way to go, soccer wolves!! [clap] Soccer is back in action TOMORROW with a big game at Gunston. Calling all MUNners! The WMS Model UN Club will be meeting on THURSDAY during ASP 1 in room 202. Participants will be preparing for the upcoming HAMUN conference — so you WON’T want to miss it. See Ms. Carlson with any questions. Grab your frisbees, gentlemen! The start of the Boys Ultimate Frisbee Team is just one week away — beginning MONDAY, October 15th. Interested “spinners” are encouraged to sign-up on the activities board by the cafeteria. Whether you’re an old-pro or a first-timer — ALL are welcome! See Mr. Smolinski with any questions. Attention 7th graders — It’s time to GET DOWN and BOOOOOOOO-gie! Just in time for Halloween, the 7th grade Spook-tacular Skeleton Stomp is coming at you — courtesy of the WMS PTA. It’s scheduled for TUESDAY, October 23 during ASP 1 and 2 in the cafeteria — so you can still take the late bus home. There will be food, a DJ and dancing, games, raffles, prizes and more. And please — despite the Halloween theme — NO COSTUMES. Pay close attention — because TOMORROW these Champions will be the focus of a Trivia Contest at your grade-level lunch. Ready? Here we go! 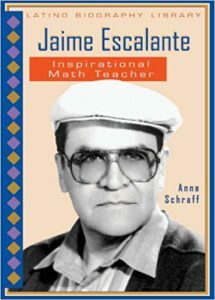 Meet Jaime Escalante, who during the 80s and 90s was one of the most famous TEACHERS in America. 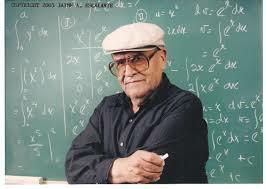 Escalante — originally from Bolivia — taught CALCULUS to underpriviledged and primarily minority students in East L.A — even though virtually NO ONE thought they could learn it. But not only DID they learn it, his ENTIRE CLASS took and PASSED the Advanced Placement Calculus Exam! But that’s just the beginning of the story. 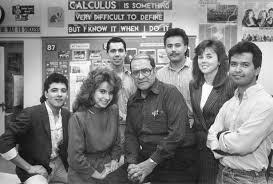 Escalante’s class was accused of CHEATING — without any evidence — and their scores were invalidated. But Escalante said his students were being discriminated against because they were Hispanic and from a poor school. So they took the test again — and everyone passed AGAIN — proving that ANYONE can succeed if given the right support. 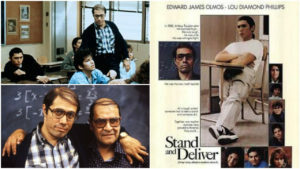 Escalante’s story was made into an Academy Award nominated movie — and he continued to teach until 2001. His efforts truly made him a CHAMPION OF CHANGE! !